Located on the Tuscan/ Umbrian borders, perched on a hill, the villa has a privileged prosition standing proud above the Upper Tiber Valley, Sansepolcro, San Giustino, Anghiari, Citerna, Città di Castello. Views are unique. The house is in a very quiet position, secluded, but only 2 minutes by car from the next village. The garden and grounds have been professionally landscaped and contain planting typical of the region: sunflowers, olives, vineyards, lavender, cypress, figs and roses. The magnificent modern pool has been built inside an antique Roman 'vasca' from the 18 century to keep the original structure, unique in its kind. It is surrounded by big gardens with summer beds, plants and olive trees and overlooks the Tuscan and Umbrian Hills. A well planned restoration has transformed the mainhouse, the former tobacco drying house and the barn in a charming residence with antique terracotta floors and beamed ceilings. The villa is suitable for large families and group of friends and offers a lot of privacy. The sleeping rooms are spacious, cosy and comfortable. Bathrooms are nice and have all hairdryers. For social gatherings, the ground floor has been converted to a living room which opens onto the large country kitchen, very well equipped, with family sized fridge and freezer, microwave, oven and dishwasher. The kitchen doors open to a wonderful summer dining pergola situated in the garden which is covered with vines. Seating is for up to 10-12 people with its’ own bbq. Dock station for your entertainment. Near the living/kitchen section there is another bathroom with shower, basin, WC. Just imagine sitting sipping your cool glass of white wine whilst the men do the cooking for a change! The lounge contains a pull out double bed for those extra guests complete with bathroom, toilet, sink and shower. All units have free wifi internet access,sat-tv, Netflix, cd-stereo, dvd player with dvds, library with books in all languages. Outside area has big gardens with herbs, roses, lavender, pine trees and olive trees. Private romantic pool overlooking the hills. Terraces some in the full sun, some in the shade, 10 summer beds, patio. Two summer dining pergolas with eating area, bbq, dining table seating 10-12. As well as embrancing the 'dolce far niente' attitude clebrated by the Italians and indulging in some complete relaxation, on request guests can enjoy acts such as cooking lessons, where a professional chef will come to the house and show how to make home made pasta. After this a 3 course menue will be served to you in the garden. The surrounding countryside offers endless possibilities for walking and cycling. The local town of San Giustino and the nearby villages Sansepolcro, Anghiari and Città di Castello offer historic centres, weekly markets, a big variety of shops and boutiques, outlets within a few minutes drive. If you are interested in art you will find them all: Piero della Francesca, Perugino, Pinturicchio, Signorelli. Città di Castello and Perugia host Umbria Jazz in July, Horse Show in September, Eurochocolate in October and the National Fair of White Truffels in November. Antique trades all year. Italys biggest Antique Market takes place every month in Arezzo.During summer you can find everywhere open air concerts, festas and sagras where the locals serve you typical food and wine. a warm welcome awaits you from the owner Karin who ensure that everyone who stays at the farmhouse experience an unforgettable holiday in the heart of Italy. Swiss born Karin, is multi-lingual and her years of experience and knowledge of the surrounding countryside and what it has to offer, will keep you coming back year after year. Karin is always available to answer any questions on the surrounding area, where to go, what markets to visit and more important she makes sure her guests are comfortable and lack nothing. Steeped in history, the main part of the house was fromerly used to dry tobacco, but has been restored into an elegant country residence complete with antique terracotta floors, beamed ceiling and original country style furniture. Lovely quirky property with lots of space and fab views. Karin is approachable and very helpful. A very nice rustic farmhouse and converted barn just what we were looking for. A very relaxing, quiet holiday set in an amazing picturesque setting. Lovely view of the surrounding hills and the quaint village below. A very good base to allow exploration of the beautiful old Italian villages and countryside. Our host Karin was very warm and welcoming, she also prepared, cooked and served an amazing four course meal as part of a birthday celebration. The accommodation is split into several self contained units with everything you need. We stayed for 11 days and each day the temperature averaged 35 deg. thank goodness for the lovely pool enjoyed by us all. Thanks again Karin for letting us stay and enjoy the fabulous views from the outside seating set under the vines. Thank you so much for the nice words. I was honored that you decided to celebrate a very important birthday at the house. Your familiy, 3 generations, have been lovely guests. This is the right target for this house, big families or group of friends holidaying together...the accommodation permits for everybody to have its privacy but then all can gather together in the big kitchen/living space and summer dining pergola to prepare food and bbq. We had a lovely time at Casa Spertaglia, set high into the hills with great views below. The accommodation comprised a very spacious double room and shower room, two further double rooms sharing a bathroom and small kitchen, and a double room with kitchen in a separate building (with main kitchen and dining room below). We also had two outside seating areas, which we enjoyed using for breakfast and dinner. Our host, Karin, lives in the main house but was careful to preserve our privacy. Karin was a great source of local knowledge, and took us to a fab truffle experience. The pool is secluded and a constant depth (around 4.5ft). We had a peaceful time and enjoyed visiting historic places such as Anghiari and Assisi. We are 4 couples who have shared several 1 week rentals over the past 10 years in various towns in Italy and France. We have yet to have a bad experience and Casa Spergaglia is another winner thanks, in no small part to our host. The rooms are clean, beds comfortable, the kitchen and dining areas are excellent, the views awesome and the pool is perfect for cooling down after a full day of exploring this wonderful part of Italy. Karin is wealth of information and advice for places to visit. We too, partook of the oil tasting and cooking class/dinner which are not to be missed. Topping our list, Karin led us out to da Vasco, a family run restaurant in the country side for a taste of local cuisine and culture. It was unpretentious, not expensive and the locall sourced food was fabulous. Thanks Karin, for a lovely week. Thanks for your nice words...they mean a lot to me. You have been a wonderful group and I enjoyed very much also our cooking class and the visit to the oil mill. Gorgeous house, excellent host, wonderful views! 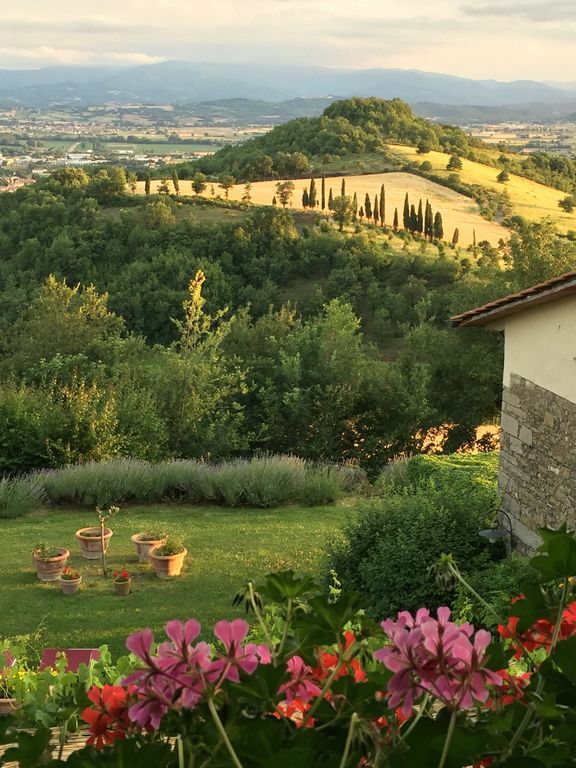 Our extended family spent a great week in August at Casa Spartaglia: stunning views across the valley, spacious accommodation and a lush garden that invited you to relax and forget about the world. Our host Karin was attentive, witty and went the extra mile to make this a memorable holiday for young and not so young. The trip to the olive oil farm was a highlight, and so was the cookery evening which gave our sons a whale of a time making gnocchi and out-of-this-world tiramisu'. We weren't blessed with good weather (the heat wave decided to stop for that week), but it did not spoil our al fresco dining. As the location is at the border between Tuscany and Umbria, we had lots of outing and sightseeing opportunities. Personally, I was not overly impressed with the nearest village San Giustino and the nearest town Sansepolcro, but nearby Anghiari was a gem! I highly recommend this home away from home. Dear Helga, thank you for the many compliments and lovely words regarding the property and my person. It was lovely having met your family and sweet kids. Yes, San Giustino is a small village but still has several restaurants, bars and 3 supermarkets. In San Giustino - although being a small village - we are proud to mention that the center of the village contains the famous 15th Century Bufalini Castle with a stunning Italian Labyrinth garden. The Bufalini Castle is a rare example of an almost intact historical patrician manor that preserves most of its original furnitures and fittings. Turists remain impressed with the collection of paintings, tapestry, china wear, majolica and various busts of Ancient Rome. The rooms contain stunning frescoes, stucco decoration rooms and trompe l'oeil (which I personally adore). Dear Helga, maybe, since during your stay, you had several days of rain, you could not really enjoy nearby Sansepolcro which contains in its ancient walls the old elegant town. The vivid "Corso" hosts the local markets and is full of high quality shops and many restaurants and bars where guests can enjoy al fresco dining. In Sansepolcro turists can also follow the art trail from famous Renaissance Painter Piero della Francesco, who was born there. His masterpiece, "The Resurrection" is seen in the civic museum and has been described as "the greatest picture in the world" by Aldous Huxley. By the way....the painting and therefore the village of Sansepolcro was saved from distruction in World War Two by a British artillery officer who loved art and wanted to protect the painting. I agree that nearby Anghiari is a gem. I hope you can come back one day with family and friends. Although nestling in the hills, the property is quiet and secluded but is very conveniently located, close to the village of San Giustino, just. 2 minutes by car. Its position on theTuscan/Umbrian border makes this villa a perfect base for touring Tuscany, Umbria and The Marche. The artistic treasures of Sansepolcro, Cortona, Caprese Michelangelo (the artist’s birthplace),Arezzo, Perugia, Assisi, Gubbio, Spoleto, Orvieto and Trasimeno Lake are close by. Florence (120km), Siena (120km), Pisa (150km), San Gimignano, (119km), Chianti region (60km), Montefalco wine road (80km) Mediterranean and Adriatic Costs, Rome and Bologna are are no more than 2hrs travel by car. New: visit Rome with Italys fast train: 80 minutes from Arezzo!!! The place is easily accessed from international airports. The farmhouse is located close two old market towns, Città di Castello in Umbria (15km) and Sansepolcro in Tuscany (6km). Both offer a big variety of shops and restaurants, often with 'all fresco' eating. The local food and wine is delicious! Visit the 15 century Bufalini castle with its Italian Labyrinth garden in San Giustino. It is a rare example of an almost intact historical patrician manor, explore the close renaissance town of Città di Castello, enjoy the local market, visit the famous Alberto Burri collection (New York is hosting an important Burri exhibition at the Guggeneheim Museum in October 2015), relax in the new termal bath and day spa 'Fontecchio', visit Assisi, the most famous spiritual place in Italy, visit Montone, Gubbio and Perugia, Umbrias capital, the Perugina chocolate factory, visit Orvieto and the St. Patrick well, make a winetour in Montefalco, explore the Trasimeno lake, visit Spoleto, Spello, have lunch at the Clitunno springs. visit nearby Sansepolcro with its vivid corso and designer shops, follow the art trail from Renaissance Painter Piero della Francesca who was born there and whose masterpiece "The Resurrection" is seen in the civic museum. The painting was described as "the greatest picture in the world" by Aldous Huxley and saved from destrucion in World War Two by a British artillery officer who loved art. Anghiari a gem, Arezzo and the antique market, Florence, Pisa with the leading tower, Lucca, Siena, make a winetour in the Chianti region. Visit Cortona ('under the Tuscan Sun'), San Gimignano, taste the Brunello wines in Montalcino and Montepulciano. Have your best 'gelato' in Italys most famous Gelateria owned by the Italian champion of Gelato making in San Giustino, 2 minutes drive from the house. Head for a 'sagra' and experience real rural Italy! Notes to the rental rates:. Rates include lodging, linen for all beds, bath + kitchen and all utilities except central heating (paid daily according to consumption). Free fresh linen every week for bath and bed, pool towels available if requested. Final cleaning 10 Euros a person. On request maid service, laundry service..